Now that I have published my desire to pursue the dreams that my late husband I had wanted to do next year, I’m getting a lot of questions, looks and concerns about why would I do such a crazy adventure on a motorcycle and alone. * How will you support this trip financially? * What will you do about a job when you get back? * What will you do if you break down or get sick? * How will you protect yourself from dangers? The questions above are the reasons why I haven’t left yet. I’m still in the preparation stage and still have to deal with the sale of the estate which will help provide for this trip. Believe it or not but I did learn something in Girl Scout; “Be Prepared” or was that from being a Den Mom in Boy Scout. Anyway, I guess practice will make the journey go a bit smoother, I hope. The questions below are the reason I’m hoping to figure out but I do realize that I may or may not find them but I will never know until I try. One thing I do know that I don’t want to have is regrets for not trying to find the answers that I’m looking for? * What if you don’t find closure that you’re looking for? 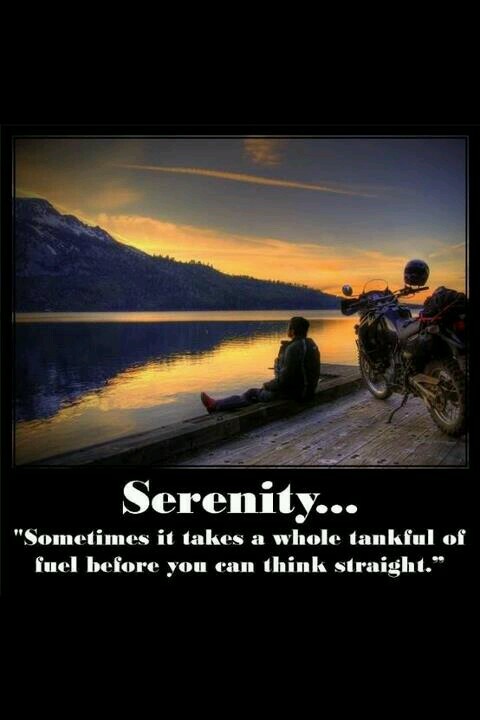 * What if you don’t find serenity that you’re seeking? * What if you don’t figure out what you want to do with the rest of your life? You may not understand my motivations or desires to pursue this dream but this poem below may help you with some insight. This was written by a friend that my late husband and I met through the TW200 community. I’m grateful that I have his permission to share this poem with all of you. He and his wife have had an amazing journey in life as well. I hope that I can write their story of experience, strength and hope with their permission someday. Sure I have my beliefs and I’m persuaded in them (and as a true seeker, could be persuaded out of them) but you know what, when it is all said and done I don’t have a vote on the reality of them! They are real to me now and I love to ponder and think, to reason and debate. But in reality I don’t have a vote on their actuality. But I do know this: I’m going to die. But in case you’d like to know, my theology of death points me to God and resurrection. This makes death only a “dirt nap” from which I’ll awake and stand in the presence of the God of all grace on a new earth. And since I like naps and I like waking up from naps, the idea of resurrection comforts me. I must die alone, i.e. no one can do it for me. If the timing of my death allows, then just like my birth, I want the lovers of my life to help me transition into this final nap. To want to daily ask myself am I living in such a way that honors deaths arrival? Forgive me that if in my pursuit of life I don’t do it the way others think it should be done – but hey, they can live their life their way. So, if you find me looking around, pursuing passion with eyes and heart wide open like a little child, and pursuing experiences that you don’t understand, just remember and rejoice with me as I’m wanting to greet death with the best gift I can give – a full life of me. Allow others to live their life, to follow their heart, to listen to the way death whispers to them to live. Listen, embrace, and love unconditionally those around us for they too are in the journey. Life honors the God of the universe, the divine of self, and the divine of fellow humans. Excellent Stuff from a fellow TW traveler….as Jeff states, we are all going to die. As someone in reasonable good health at 65 I’m in no hurry, but I also know that for the most part it will not be mine to choose a time or event or location….rise up and live like there is no tomorrow, because how do we know there will be? Good planning GM and God be with you In both the planning and adventure that awaits. Thank you Hoot for your support and looking forward to meeting you in person when I’m on ride. ‘Be prepared’ and go for it! If you find it’s not what you want, you’ll do something else. You are young, healthy, and resourceful so this is the BEST time for an adventure. Keep a journal. Keep us posted! ps The opposite of LOVE is FEAR. Honor the love, and don’t be paralyzed by fear of the unknown. Thank you Laura! Interesting analogy about love and fear. I’m not afraid of this journey but I’m afraid of not finding love again like I had with Russ. I was truly blessed to have had him in life and sadden that he was taken too soon from me. A question we’ve both been asked before. “If you have to ask the question, you may not understand the answer” often comes to mind when as I think about the answer. But ultimately we both know lifes2short, so we have to live everyday like it’s a gift. I was going to wish you much strength and courage but I believe you have both in spades, so I wish you safe travels on your healing road. Thank you Mark, I enjoy reading your blog as well and it warms my heart seeing a couple taking life to it fullest. Safe travels on your journey as well.